Researchers show how common cancers hijack and deform mitochondrial fission. In a breakthrough in the understanding of how cancer does its deadly work, researchers at the University of Virginia have shown that many cancers, including nearly all pancreatic cancers, enslave and deform mitochondria, the powerhouses of cells, to create an environment more conducive to tumour growth. In such cases, the researchers have shown, the mitochondria are being forced to divide unnaturally, to lose their normal shape and collapse around the cell’s nucleus. The end result is an environment more hospitable to cancer. By blocking this process, doctors one day may be able to block the growth of such tumours. The opensource study is published in the journal Molecular Cell. The data findings suggest that in combination with other inhibitors, the medical community may one day target this process of mitochondrial division, mitochondrial fission. The current study looked at tumours caused by mutations in the gene Ras, which is mutated in up to 30 percent of all cancers. Ras activates a cellular signaling pathway, the MAP kinase pathway, that was discovered by the team in previous studies. That cellular communication is prompting mitochondria to act very strangely, to divide with a frequency they normally wouldn’t. While mitochondria are popularly thought to resemble beans floating in the cellular cytoplasm, recent research has shown they’re actually long, stringy interconnected networks that constantly fuse and divide. The team state that Ras appears to send that division process into overdrive, both in mouse models and in cell lines created from human pancreatic cancer samples. The current study saw a similar finding in both, when the team knocked down the cells’ ability to divide their mitochondria, they blocked tumour growth. The team state that the data findings point to a promising new target for developing cancer drugs, adding that over the years the medical community has identified vulnerabilities in some of the pathways activated by Ras, targets that can inhibit tumour growth for a short time. However, the problem is that the tumours always find a way to come back. The team surmise that additional targets are needed and what this new study may provide is an additional target in Ras and MAP kinase-driven cancers. Ras is mutated in up to 30% of cancers, including 90% of pancreatic ductal adenocarcinomas, causing it to be constitutively GTP-bound, and leading to activation of downstream effectors that promote a tumorigenic phenotype. As targeting Ras directly is difficult, there is a significant effort to understand the downstream biological processes that underlie its protumorigenic activity. Here, we show that expression of oncogenic Ras or direct activation of the MAPK pathway leads to increased mitochondrial fragmentation and that blocking this phenotype, through knockdown of the mitochondrial fission-mediating GTPase Drp1, inhibits tumor growth. This fission is driven by Erk2-mediated phosphorylation of Drp1 on Serine 616, and both this phosphorylation and mitochondrial fragmentation are increased in human pancreatic cancer. Finally, this phosphorylation is required for Ras-associated mitochondrial fission, and its inhibition is sufficient to block xenograft growth. Collectively, these data suggest mitochondrial fission may be a target for treating MAPK-driven malignancies. 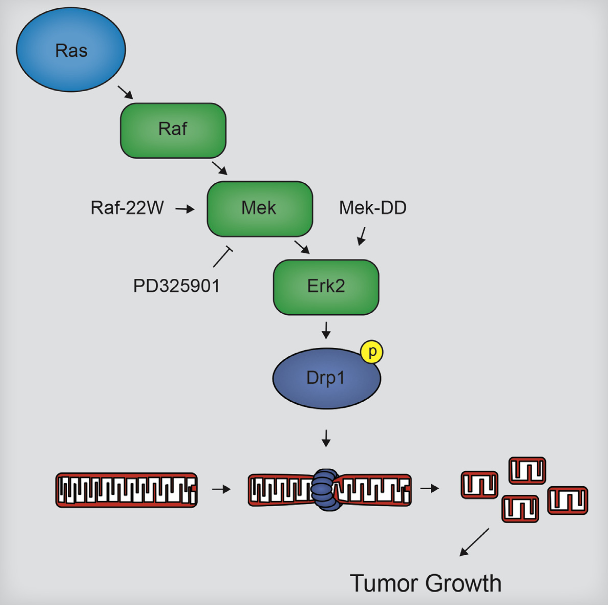 Erk2 Phosphorylation of Drp1 Promotes Mitochondrial Fission and MAPK-Driven Tumor Growth. Kashatus et al 2015.